Your Franz Kessler spindle is in expert hands with the factory-trained, Big Plus–certified technicians at High Speed Technologies, Inc. We have repaired dozens of Franz Kessler spindles to original factory performance. Need it fast? 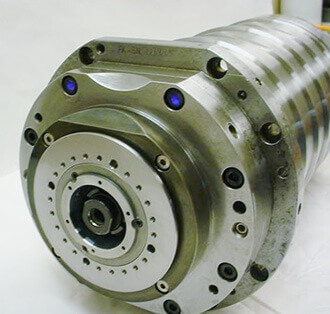 We can repair and rebuild your spindle within three days of customer approval, and we offer reduced pricing for longer lead times. All spindle repairs are backed by a complete warranty and our 30-year reputation of OEM-quality spindle repair. For expert Franz Kessler spindle repair, email using the form or call us at 1-603-483-0333 for a quote. We are fast, experienced, and our work is guaranteed. Franz Kessler is well-known for manufacturing high-end motorized and non-motorized spindles. Started in 1923 to provide specialized motors for the textile industry, Franz Kessler has morphed into a manufacturer of high-end machine tool spindles. Franz Kessler spindles are powerful, fast and excellent. 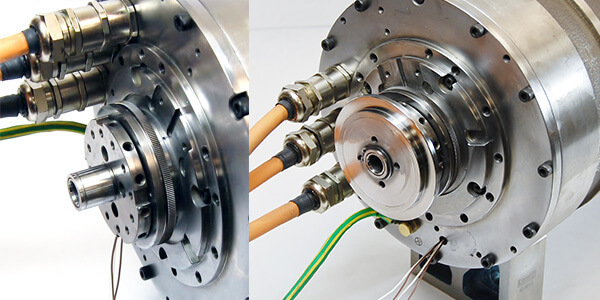 They often incorporate a rather unique design feature using compliant or constant preload on the front and back of the spindle. HST technicians are thoroughly familiar with these designs and appreciate working on high-quality spindles. A Franz Kessler Spindle off of a Deckel Maho machine. 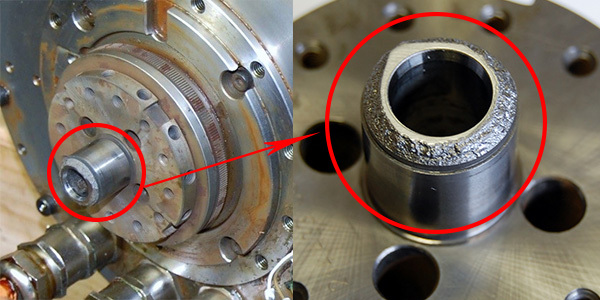 Before and after our spindle repair. 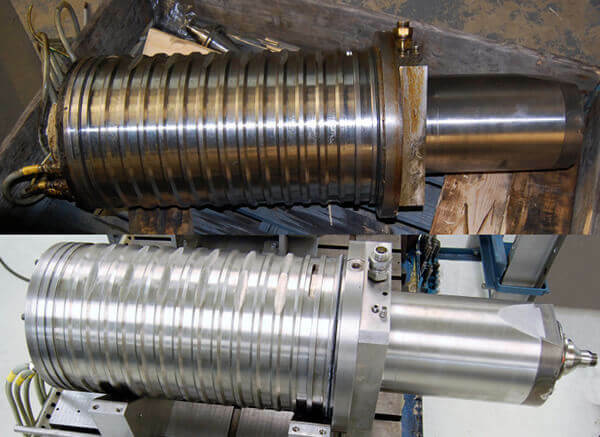 Below are other examples of HST’s OEM-quality repairs on Franz Kessler motorized and nonmotorized spindles. 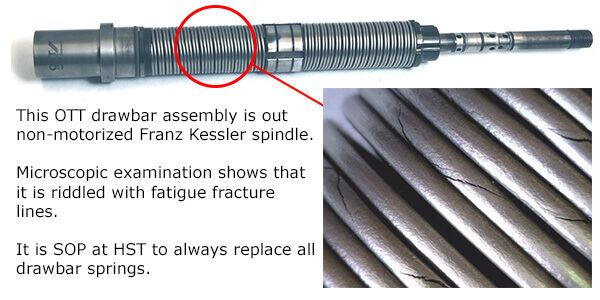 For expert Franz Kessler spindle repair, call us at 1-603-483-0333 for a quote. We are fast, experienced, and our work is guaranteed. This model 000.652.304 Franz Kessler spindle suffered from a hard vertical crash. The crash instantly destroyed the bearings. The races on the # 1 bearing were heavily brinelled. Fortunately the rest of the spindle appeared unscathed. The # 1 bearing is completely destroyed. Note the heavy brinell marks on the outer race. Those are the unambiguous marks of a hard crash. To help avoid crashes we offer free software to our customers who use our services to repair a spindle. One of the reasons we really like repairing Franz Kessler spindles is because they run great after our comprehensive rebuild. This very substantial spindle had vibration readings of 0.02600 in/sec at 18,000 RPM! And the run-out at the end of a 300mm test bar was only 1µm! Fantastic. HST Techs check all sensors for proper operation. A Franz Kessler spindle completed. After the operational performance testing is complete the pull force is checked on one of our dynamometers. And every sensor is checked for proper operation and adjustment. Once the spindle has passed all tests it is ready to be crated. High precision spindles require special considerations for shipping and storage. An expensive repair can be completely ruined in transport. So HST takes extraordinary care in packaging and protecting your spindle for transport. And we recommend that customers do the same even when shipping a damaged spindle to us for repair. 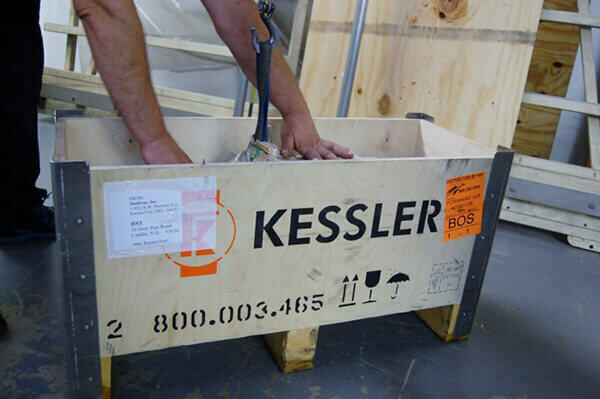 Rust inhibiting coating, foam packing, water repellent wrap and a stout crate help insure that your Franz Kessler spindle will arrive in perfect condition. This 33 HP, 60000 RPM spindle was off of a DMG 80H. The draw bar seal had failed allowing tool coolant to wash the grease out the bearings. Subsequently this spindle failed due to damaged bearings. However, our careful forensic examination also found strong indications of poor bearing fit and misalignment. So a comprehensive repair included GPG to correct the fit. Liquid contamination is clearly seen in the left photo. Notice the fretting corrosion on right side photo. This is indicative of a loose fit. 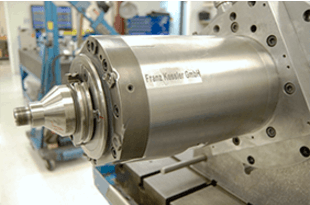 This particular type of Franz Kessler spindle is actually two spindles in one or a milling spindle attached to a high precision, high frequency motor. The repair is treated like two separate spindles. Because when everything is fully assembled there is no access to the front of the motor and back of the spindle, each half must be precision high speed balanced prior to assembly. During preliminary balancing the motor section is run off of a high frequency drive; but the front half must be belt driven on one of our run-up stations. Once the two halves are assembled we only need minor trim balancing. Two halves of a Franz Kessler spindle coming apart. Note the spline connection. We’re not big fans of spline connections because by design they must have some clearance which can induce vibrations. However, Franz Kessler has mastered this type of connection with a great deal of success. At 6000 RPM the vibration readings on this substantial spindle were 0.03907 in/sec in the front and 0.02355 in the back. A DMG 80 Franz Kessler spindle getting ready for final testing. The spindle was off of a Deckel Maho machine. The bearings were damaged and the stator needed a rewind. This repair is an example of how the failure of a small component can snowball and result in many thousands of dollars’ worth of damage. It is also a good example of how we make your problem our problem. The original problem started when a circlip sheared off the edge of a retaining groove on a balance ring in back of the spindle. This circlip held the rotary union on the shaft. Once the circlip sheared the rotary union lifted off the end of the shaft and allowed tool coolant to flow freely down the inside of the spindle. That wiped out the bearings. It also migrated into the stator windings and even after a “bake” the stator still failed. But the big question now was how to get this production critical machine back up and running. The broken parts was months away from delivery. Making a new part and heat treating and grinding it were several weeks out. HST to the rescue. We ground down the OD and made a sleeve that was heat shrunk onto the original part. Then that was ground to exact original dimensions. That was done in just 3 days. With HST ingenuity the part was back together in days not weeks. But what about the stator? HST only works certain top quality rewind houses for high end, high frequency motors. It is also our normal procedure to upgrade factory motor windings to “E-Pak’ insulation. The E-Pak resin is a 2-part filled epoxy, UL recognized for use up to class H (180°C). Our rewind vendor worked with us to fast track this job. So the spindle was back together in less than two weeks instead of two months. We don’t wear red capes. But sometimes our customers think we’re heroes. Their production critical machine was back up in running in just over two weeks. Better than OEM E-pak. Spindle ready to be crated. The performance was great. Vibration was 0.02515 in/sec front and 0.01627 rear. Run out was 3µm on the test bar. For our customer it was a three way win; faster, less costly, and good. Our customer crashed this spindle rather hard damaging the front nose cover. However when we opened up and inspected the spindle we found severe liquid contamination and the housing bore was 20µm oversize. This spindle definitely needed journal restoration with our GPG process. We understand how crashes happen and we offer software to help prevent it. But how did the liquid get in? That’s where our forensic analysis comes in and the answer didn’t take long to figure out. The ceramic seal on the rotary union was damaged. This allowed coolant to flow down the inside of the spindle. This Franz Kessler had a locking mechanism that allows the mill spindle to be used as a tool post. This has become a popular feature for modern machining centers. It allows for Five Side and Six Side machining or as Mazak calls it “Done in One”. Similar to other designs the Franz Kessler locking mechanism is hydraulically actuated and spring released. This adds somewhat more complexity to a repair and it is definitely a “Beginners” spindle. At HST we’ll replace every seal and check every spring to make sure that your spindle will perform like it should. Three serrated rings lock the shaft into position so it can function as a tool post. One ring is fixed to the shaft, one ring is fixed to the housing and a third ring couples the shaft to the housing to hold it ridged. The damaged parts were many weeks out from the OEM. So we reversed engineered them and had them made in about one week. Faster, less expensive and good another win, win, win experience for our customer. How were the numbers at 12,000 RPM? Real good! All well within OEM specifications. One reason that we like repairing Franz Kessler spindle is because they consistently run great! This spindle came from a major US aircraft manufacturer in Seattle. The customer described the problem with this spindle that came off of a DMG as “blunt force trauma’. We call it a crash; one of the fastest ways to take a spindle out of commission. The result was brinelled front bearings and damaged nose cap. We welded up the nose cap and ground it to exact size. We replaced all of the bearings with a comprehensive rebuild and the spindle was as good as new. The machine was in full operation when the customer heard a loud noise and the machine shut down. When we got the spindle the shaft was seized. It didn’t take long to discover the problem; lubrication degradation. The grease in the front bearings had completely dried out and failed. The heat generated caused the bearing cage to fail. This in turn allowed to rolling elements to “clump” together and seize the shaft. Often, before catastrophic failure, the spindle provides some indications of the impending failure. However, the customer did not experience the typical harbingers such as noise, vibration or chatter marks. Fortunately for the customer the sudden seizure did not experience any “collateral damage”. Other critical surfaces such as housing and bearing journals were still in serviceable limits. The only other work required was a “kiss” grind on the taper ID. At HST we only use the highest quality lubricants. For this 10,000 RPM spindle we will use a Kluber NBU-15. Why did this lubricant fail? Hard to say for sure. But because it was the # 1 bearing that failed and the other bearings looked pretty good we suspect contamination getting past the front cover. Remember that high speed spindles do not have positive seals. So the #1 bearing is very susceptible to contamination. Before and after repair all sensors are tested. Note the anti-tamper marks. So how did this rather large spindle perform after our rebuild? In a word, great; 0.02220 in/sec at the front at 10,000 RPM and less than 1µm run-out on the taper. At HST it is our standard procedure to replace all drawbar springs. Why? Because unless our customer tells us differently the springs may be well on their way to fatigue failure. 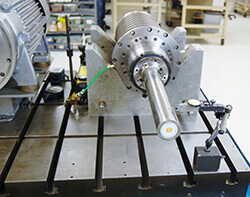 This particular spindle is a non-motorized unit off of a Vigel dual spindle machine. Like most Franz Kessler spindles this one uses an OTT drawbar assembly. At first blush this drawbar assembly looks OK. But upon closer examination we can see the springs are riddled with fatigue facture lines. We set all HSK drawbar and gripper assemblies to OEM specifications. All clamping units must pass our stringent testing. After setting the gripper assembly to specification we test the run-out at 300 mm on a certified test bar. All spindles must pass a battery of tests before they can ship. Testing the run out on a Franz Kessler spindle.